I’m paranoid about emergencies on IFR departures. Maybe it’s because I’ve had four attitude indicator (AI) failures in flight, twice in IMC. One of those was even a certified primary flight display (PFD) from a major manufacturer, so don’t assume glass panels are immune. Indulge me in the retelling of one of those to illustrate a life-extending habit: Essential to a safe departure in instrument conditions is a pre-loaded plan for a safe return. As we taxied the Cessna out for this IFR training flight, the AI was a bit loud and a bit lazy (sort of like a brother-in-law). By the runup area, however, it appeared normal. This was near the end of the student’s training, so I chose not to say anything about the AI. I did remind him of our procedure to always have the return approach selected, tuned, and briefed before any IMC departure. We rotated into 300 overcast and he settled in on the instruments, correcting with a timid left bank for the fact that the attitude indicator showed us banking about couple degrees right. Except we were turning left. To his high credit, he focused on the six-pack of instruments, recognized the attitude and turn coordinator disagreed, registered the heading and GPS confirmed the turn coordinator’s story, and leveled the wings. He even made a gentle pitch adjustment to ensure we held VY. The attitude indicator showed about seven degrees of right bank by the time Tower sent us over to Departure. “You got this?” I asked. “I have the radios. You fly the airplane.” I contacted Departure and told them we required vectors back to the ILS Runway 11, full stop, because we had lost a flight instrument. Having an emergency return plan does two things for you. It saves time and fumbling by having the approach loaded or frequencies tuned, and the approach chart on hand. Perhaps more importantly, however, is avoiding the “What now?” decision under stress. Stress doesn’t promote the best decisions, and the deciding eats valuable time. Start your planning before takeoff by deciding if a VFR return is possible. Just because the airport is reporting ceilings of 1,500 AGL doesn’t mean that ATC can let you back down to 1,500 once you’ve entered the clouds. Controllers have minimum altitudes for vectoring aircraft. They’re called Minimum Vectoring Altitudes (MVAs) for Approach facilities and Minimum IFR Altitudes (MIAs) for Centers, and are published on the FAA website. Don’t get too excited; the format requires some creative overlay of sectional charts to decode. A better choice is asking ATC during a quiet moment what the MVAs are around the airports you frequent. You can also look at the Off-Route Obstruction Clearance Altitudes on your low-altitude instrument charts. The MVAs/MIAs are rarely higher than those. If the ceilings are higher than the MVA, you should be able to get vectors back down below the clouds into visual conditions. That makes the emergency return much easier. Don’t sweat the legal requirements for a visual approach. This plan is hedging against an emergency. The MVA/MIA charts from the FAA are as spartan as they are unhelpful. With some figuring, you can overlay one on a sectional like this. Your local Approach facility has a chart like this. Ask to see it if you can get a facility tour. If you can’t guarantee a visual return with simple vectors, select a specific approach to use for your emergency plan. Start with the approaches back into your departure airport. Returning there is logical. You have the communication frequencies dialed in and the airport layout is fresh in your mind. It’ll certainly be one of the nearest airports if issues arise soon after takeoff. It might not be the best choice, however, or even the most expeditious. Neighboring airports are often aligned on similar headings. It may be faster to continue flying straight ahead and join the final approach course for an airport ahead of you rather than do an about-face back to where you departed, especially because you’ll likely go past that airport on vectors to the approach in use. This brings up the important decision: Do you load the approach in use or the one that’s the fastest 180-to-land? My personal vote is the approach in use because I’m preparing for a problem, not a catastrophe. If things are so dire that I must make an immediate turn back to the airport—imminent engine failure in a single, for example—I may not have the luxury of an approach. I’m just going for a runway via wherever I think the towers are furthest apart. There are far more abnormal situations that warrant a return than outright emergencies where every minute counts. In commercial operations, preparing to abort the flight at a different airport than you’re leaving is called a departure alternate. It’s often required when conditions make an IFR return to the departure airport unlikely or impossible. Even if returning to your departure airport is possible, it still might be the wrong plan. If you’re departing a small field with limited services, landing there deals with the immediate issue, but leaves you stuck with a problem airplane and longing for better cell coverage. Major repair services and rental cars are almost as good a reason to plan a departure alternate as better approaches and on-field crash and rescue. An operating control tower is also of value when you’re coming in with a problem. Factor all of that in. Once you select the just-in-case approach, load it before takeoff. GPS navigators are all different on how well they let you load an approach for the airport that’s not your destination. Experiment and learn what works best for you. When you’re enroute with everything humming nicely, you can delete the unused approach at your leisure. If nothing else, you can probably set up an ILS frequency in your navigator when you’re using GPS for navigation on departure. Load any other frequencies you might need in an empty slot if you have one. Then brief the approach, including where you’ll be coming from. If vectors aren’t an option, decide how you’ll get from the scene of the problem to the initial fix for the approach. Then, switch your focus to the actual departure at hand, confident that if you ever need the emergency return, you have a plan. These days of following magenta lines and one-button loading of approaches enable a perilous absence of forethought. This temptation is especially easy on an instrument departure when we’re focused on getting up and into the system. The adage is: “Takeoff stresses the aircraft; landing stresses the pilot.” Let takeoffs stress you just a bit more, especially when conditions are marginal VFR or less. Visual departures on beautiful days should also have a plan for immediate emergencies. The path back to the airport with a flyable airplane isn’t an issue. You know that’ll be visual. But there is still value in preloading as many decisions before pouring on takeoff power. My new habit is briefing this before engine start using a top-down view on the iPad. I’ll review the runway in use and my expected takeoff performance. This isn’t a checkride-prep calculation. It’s just a point on the runway where I should be airborne (or have reached a certain percentage of rotation speed) and still have room to abort. The top-down view of the airport helps me select a taxiway or real building as a reference point. Any problem before that point is a rejected takeoff with time to stop, taxi off the runway, and then reflect on the issue. A problem after that point might be an overrun, or an off-field landing. So, I’ll zoom out and look around the airport with a satellite view. If I’m too low to turn back to the airport, will a slight turn left or right offer a field? Which way would be more into the wind? If I am high enough to turn back, which runway would be best? Planning a Runway 33 departure from Groton, CT, not long ago, I noted a golf course that would be just a slight right turn. Are there airports I’ll be passing over along my departure route? That’s also a good time to switch to a sectional chart and double-check any airspace you might skirt on the way to cruise altitude. You can keep this thinking up during the flight. If I have a problem now, where would I go? 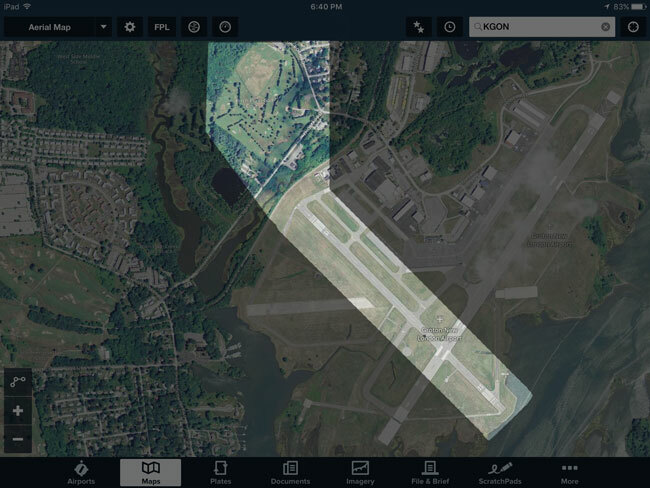 Pick an actual airport and practice calling up the critical information quickly: heading, distance, airport elevation, frequencies, and runway orientations—probably in that order. Not only is it good practice for ongoing safety, it keeps you engaged in your flight in a way GPS direct and watching the scenery roll by never could. You can read more on this subject, or other instrument flying topics, in Jeff’s IFR Focus blog. 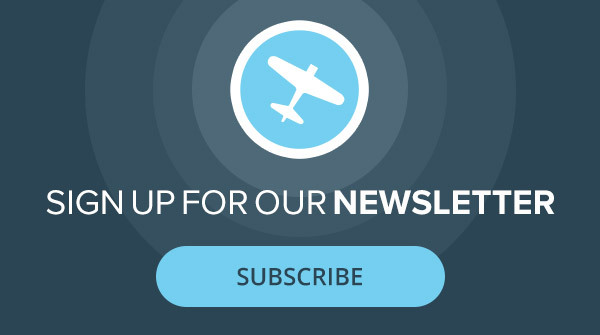 Want more articles on instrument flying and related VFR options? Check out our Inside IFR archive.